Here are summaries of ethics opinions issued January, February, and August 2016. The opinions were issued by the NYSBA Committee on Professional Ethics and the NYC Bar Association Committee on Professional Ethics. NYLER will continue to provide updates on new ethics opinions issued by these and other ethics committees in New York State. 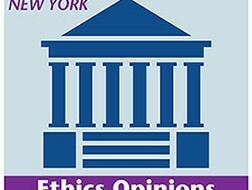 For information about how to obtain an ethics opinion from the NYS Bar Association Committee on Professional Ethics, please visit http://www.nysba.org/Ethics/. In Opinion 1083, a lawyer whose firm represented a number of nursing homes, sought to create a non-profit organization for the purpose of accepting judicial appointments of low-asset nursing home residents who are incapacitated and in need of assistance. The Opinion addressed whether the lawyer’s firm could, in certain situations, represent both the nursing home and the nonprofit organization without creating an impermissible conflict of interest. The Opinion assumed that both the nursing home and the nonprofit were “continuing clients” of the firm, meaning that both would be considered “current clients” of the firm. Therefore, the Opinion reasoned, any conflict analysis would be governed by Rule 1.7 of the New York Rules of Professional Conduct (Rules). Under Rule 1.7, the law firm could not represent both the nonprofit and the nursing home if the representation would (i) involve the law firm representing “differing interests” or (ii) if there was a significant risk that the lawyer’s professional judgment on behalf of either client would be adversely impacted by the lawyer’s own “financial, business, property or other personal interests.” Under Rule 1.0(f), “differing interests” are any interest that would “adversely affect either the judgment or loyalty of a lawyer to a client.” Additionally, if any one lawyer in the law firm had an impermissible conflict of interest under Rule 1.7, that conflict would be imputed to the entire firm under Rule 1.10. With respect to the corporate formation of the nonprofit, the Opinion concluded that “the law firm is acting on its own and not on behalf of a client. Consequently, the terms of Rule 1.7(a)(1) and 1.9 do not apply.” Thus, provided the lawyer did not have a “personal interest” conflict under Rule 1.7(a)(2), there would not be an ethical bar that would prohibit the lawyer or the firm from forming the nonprofit. The Opinion noted, however, that certain conflicts may arise if the law firm represented the nonprofit concurrently with the nursing home in matters where the nonprofit had been appointed guardian for nursing home residents. For instance, if the nonprofit were appointed to manage the property of the nursing home resident, then the firm could may run the risk of representing clients with “differing interest” since, in that situation, the nursing home client and the nursing home as an entity may have differing financial interests. Similarly, the Opinion reasoned, issues involving quality of care or treatment in the representation “are more likely to involve differing interests between the guardian, which must exercise the utmost degree of trust, loyalty and fidelity in relation to the incapacitated person, and the law firm’s nursing home client.” Finally, the Opinion concluded that in certain instances both clients could consent to the conflict of interest as long as the matter did not involve a claim by one client against another client or was otherwise prohibited by law. The full Opinion is available at: http://www.nysba.org/CustomTemplates/Content.aspx?id=62008. The full Opinion is available at: http://www.nysba.org/CustomTemplates/Content.aspx?id=62009. The full Opinion is available at: http://www.nysba.org/CustomTemplates/Content.aspx?id=62010. 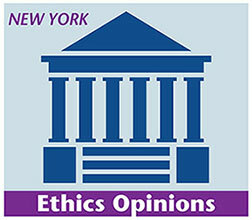 The full Opinion is available at: http://www.nycbar.org/member-and-career-services/committees/reports-listing/reports/detail/formal-opinion-2016-3-prosecutors-ethical-obligations-to-disclose-information-favorable-to-the-defense. Get CLE Credit for this month’s articles (October 2016).